Satellites in the European Commission's Sentinel/Copernicus Earth observing program. Status: Operational 2014. First Launch: 2014-04-03. Last Launch: 2014-04-03. Number: 1 . Sentinel-1A's C-band SAR was 13.3 x 0.8m in size. 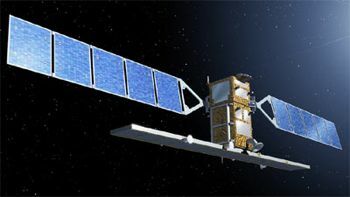 The satellite was only a quarter the mass of its predecessor Envisat which carried a wider array of instruments; in the Sentinel program there will be a series of smaller, more specialized satellites. At 05:14 GMT on April 5, Sentinel made a maneuver to avoid a very close pass by NASA's defunct ACRIMSAT satellite, which failed on December 14 2013 after suffering battery issues. Cosmo-SkyMed Italian military surveillance radar satellite. Constellation of four satellites launched 2007.06.08 - 2010.11.06. Earth Observing (Radar) satellite built by Alenia Spazio for ASI, Italy. Launched 2007 - 2010. Used the Prima Bus bus. Radarsat 2 Earth Observing (Radar) satellite built by MacDonald, Dettwiler and Associates Ltd. (MDA) (Prime), Alenia Spazio (Bus) for CSA, Canada. Launched 2007. Used the Prima Bus bus. Sentinel 1A, 1B, 1C, 1D Earth Observing (Radar) satellite built by Thales Alenia Space for ESA, Europe. Launched 2014 - 2016. Used the Prima Bus bus. Sentinel 3A, 3B, 3C, 3D Earth Observing (Ocean) satellite built by Thales Alenia Space for ESA, Europe. Launched 2016. Used the Prima Bus bus. Family: Surveillance. Country: Europe. Launch Vehicles: R-7, Soyuz-ST-A. Launch Sites: Kourou ELS. Bibliography: 6791, 12971. 2008 October 25 - . 02:28 GMT - . Launch Site: Vandenberg. Launch Complex: Vandenberg SLC2W. LV Family: Thor. Launch Vehicle: Delta 7420-10C. COSMO 3 - . Mass: 1,900 kg (4,100 lb). Nation: Italy. Agency: Martin. Class: Surveillance. Type: Civilian Radarsat. Spacecraft Bus: Prima. Spacecraft: Cosmo-SkyMed. USAF Sat Cat: 33412 . COSPAR: 2008-054A. Apogee: 623 km (387 mi). Perigee: 622 km (386 mi). Inclination: 97.90 deg. Period: 97.20 min. Part of Italy's all-weather military surveillance constellation; carried X-band synthetic aperture radar..
2010 November 6 - . 02:20 GMT - . Launch Site: Vandenberg. Launch Complex: Vandenberg SLC2W. LV Family: Thor. Launch Vehicle: Delta 7420-10C. Cosmo-SkyMed 4 - . Mass: 1,900 kg (4,100 lb). Nation: Italy. Class: Surveillance. Type: Civilian Radarsat. Spacecraft Bus: Prima. Spacecraft: Cosmo-SkyMed. USAF Sat Cat: 37216 . COSPAR: 2010-060A. Apogee: 623 km (387 mi). Perigee: 622 km (386 mi). Inclination: 97.90 deg. Period: 97.20 min. X-band radar satellite..
2016 February 16 - . 17:57 GMT - . Launch Site: Plesetsk. Launch Complex: Plesetsk LC133/3. LV Family: UR-100N. Launch Vehicle: Rokot. Sentinel-3A - . Mass: 1,200 kg (2,600 lb). Nation: Russia. Class: Surveillance. Type: Surveillance satellite. Spacecraft: Prima. USAF Sat Cat: 41335 . COSPAR: 2016-011A. Apogee: 806 km (500 mi). Perigee: 802 km (498 mi). Inclination: 98.60 deg. Eurockot/Krunichev Rokot's Briz-KM upper stage entered a 153 x 785 km transfer orbit followed by an 802 x 806 km target orbit, deploying the Sentinel-3A satellite. It then lowered perigee to 411 x 744 km to reduce orbital lifetime. ESA's Sentinel-3A was part of the European Union's Copernicus remote sensing program, and carried an ocean color imaging payload and an ocean-topography radar altimeter payload.